Essentially AngularJS is MVC framework. The obvious practice while using MVC framework is to group files based on file type. However while scaling the apps, the layout causes many folders to be open at once, causing a lot of time spent scrolling through the directory tree. Solution: Instead of keeping the files grouped by type, group files based on features. While learning directives it’s tempting and easy to just write jQuery code wrapped in Angular directive. While this is better than working with no framework, this isn’t the AngularJS way. AngularJS built-in directives, services $window, $timeout, $http are wrapped for you so you don’t have to accidently interfere with AngularJS. Solution: Don’t wrap jQuery code in a directive, only reach for custom solutions when you really have to. One of the main issue in testing arises out of dependency injection module. Often when writing AngularJS apps, there will be a dependency on an object that binds itself to the global scope. This means it’s available in any AngularJS code, causing the issues in testing. At times programmers have to integrate with jQuery or need to handle events out of AngularJS scope using callbacks. Understanding $scope.$apply become essential as model changes outside of AngularJS context are not tracked by the AngularJS model binding infrastructure. 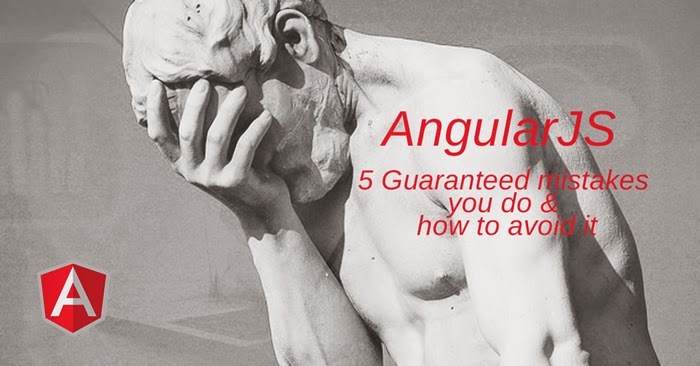 This is not just limited to AngularJS. Number of issues can be resolved just by looking at the error details in browser console log and taking corrective actions. This is not a comprehensive list but can help you get started on where to look when you are breaking your head with AngularJS. For further reading please head to Thenittygritty and AngularJS Style guide.